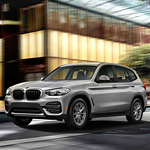 The BMW X3 is available for sale at BMW of Birmingham, and many great features are equipped in its cabin. If you're looking for a car that's built for short trips and long adventures, the BMW X3 is worth considering. Among inspecting the cargo area, you'll see 62.7 cubic feet of space, which is enough room for luggage, groceries, and other items. Under the hood, there is a highly efficient engine that helps the X3 generate 355 horsepower on the road. If you want to cruise on off-road trails in this vehicle, the X3 can handle it because its frame has a ground clearance of eight inches. Thanks to the intuitive controls, comfortable seats, and power motors, the BMW X3 provides a unique driving experience. It's an ideal automobile for trips to various destinations. You'll have no problems maneuver this automobile pass road hazards as its eight frame effectively elevates the base over snow and sand.